Our commitment to public safety begins with our workforce but extends much further to include operating strategies to strengthen the integrity of our electric, gas and energy supply infrastructure. We continue to increase public awareness about how to stay safe around our systems and facilities, and to build strong and effective partnerships with emergency responders to help ensure public safety. Gas Operations: Since the San Bruno accident, we have significantly improved the integrity of our gas system and operations. This includes earning two international certifications for best-in-class asset management processes, decommissioning all known cast-iron pipe in our system, use of mobile leak detection technology and a new end-to-end leak management system, and embracing a corrective action program to support our safety culture. Electric Operations: Our commitment to public safety can be seen in our continued work to reduce the number of downed electric wires across our service area, use new technology to respond more quickly to equipment failures, manage vegetation along our electric lines to reduce the risk of fires, and implement an extensive program to ensure our employees have the rights skills and qualifications to perform work safely. Energy Supply: We completed advanced seismic studies at our Diablo Canyon Power Plant, confirming that the plant can safely withstand extreme natural events, including potential earthquakes, tsunamis and flooding. We also continued to inspect and maintain our hydroelectric system according to strict safety guidelines, and to enhance public safety outreach in communities around our facilities. Operating in a region that regularly experiences earthquakes, wildfires and major storms, it is critical that we implement best-in-class emergency plans and procedures. PG&E’s Emergency Management Advancement Program (EMAP), launched in 2013, is an enterprise-wide effort to comprehensively review and strengthen our catastrophic emergency response plans. 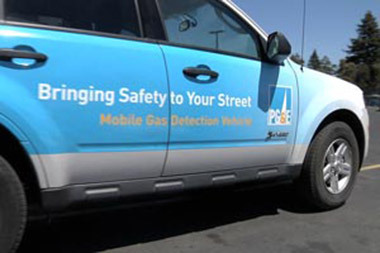 Following the 6.0-magnitude Napa earthquake in August 2014, PG&E mobilized crews to safely restore electricity to more than 70,000 customers in just over 24 hours and used state-of-the-art leak detection vehicles to check for gas leaks. Employees also went door-to-door talking to thousands of residential and business customers and performing courtesy gas safety checks. Coordination and communication between PG&E and officials who are first on the scene during an emergency are critical to keeping the public and first responders safe. Our emergency response plan—which is developed, shared and tested with emergency officials—defines clear lines of responsibility for PG&E and emergency personnel. PG&E also maintains a secured First Responder website where emergency officials can access training materials and gas transmission infrastructure information and maps. Hosted more than 500 training workshops to better prepare firefighters, police, public works officials and other authorities to respond to emergencies involving electricity and natural gas. We also met with all of the fire departments in our service area with PG&E gas transmission or distribution facilities in their region. Regularly participated in emergency-preparedness drills to test emergency response and coordination plans. This included testing our emergency response to a simulated major earthquake in the Bay Area. Hundreds of employees participated in the two-day drill, which tested PG&E’s ability to assess damage, prioritize power restoration and respond to electric and gas emergencies. As part of the drill, PG&E invited state and local first responders to evaluate our response and help make any improvements. 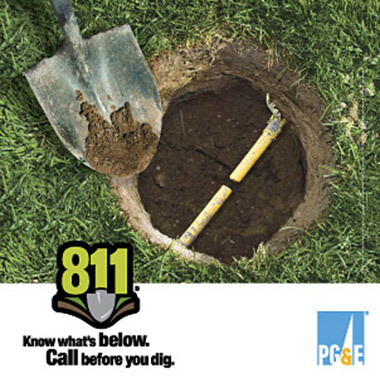 We continue to educate homeowners and professional excavators on the importance of calling 811 before digging so that PG&E can clearly mark underground equipment, helping to prevent injuries, property damage and outages. 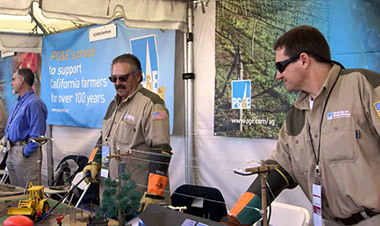 To help raise awareness about safety, PG&E conducts interactive electric and gas safety demonstrations using a traveling display that allows instructors to show potential hazards associated with gas and electric facilities. Designed for students, youth groups, contractors, emergency personnel and customers, the program enables trained PG&E gas and electric professionals to teach communities about being safe around the gas and electric services we provide. In 2014, we conducted more than 2,100 demonstrations in communities throughout our service area. Reminded the public to always call 811 before digging projects, with outreach around California Arbor Week, National Safe-Digging Month and National 811 Day. We also continued our proactive work with contractors, city and county agencies, and others to reduce “dig in” incidents in which third-party workers damage buried gas and electric lines, creating hazards for the workers and the public. Conducted outreach to residents and business owners immediately downstream from PG&E dams as part of a nationwide initiative by the Federal Energy Regulatory Commission. Through written materials and open houses, we encouraged people in dam watershed areas to have an evacuation plan and taught them to recognize signs of a dam breach. PG&E has also developed plans with state and local emergency agencies to warn the public in the unlikely event of a sudden dam failure. PG&E also places informational posters in campgrounds, parks and other recreation areas in flood inundation zones. Continued our partnership with the Red Cross to provide Californians with critical disaster preparedness training and emergency response resources. PG&E’s $1.1 million investment enabled the Red Cross to build safer, more resilient communities through programs such as Team Firestopper and the FEMA award-winning Ready Neighborhoods. Over the past three years, PG&E’s investment has helped train, educate or engage more than 2 million people in California. Provided funding to local Fire Safe Councils throughout the state. The goal of the private, public and community partnership is to prevent fires during the traditional September-October peak of California wildfire season. The funding was for fuel reduction, emergency access and defensible-space projects by local Fire Safe Councils throughout Northern and Central California. Partnered with CAL FIRE on its “One Less Spark, One Less Wildfire” public safety campaign to minimize the frequency, size and cost of wildfires started by people. Whether it’s ensuring a campfire is completely extinguished or keeping a vehicle well-maintained to prevent sparks, the campaign shows how following a few simple steps can help prevent wildfires. PG&E provided $2 million in funding to local Fire Safe Councils to install 28 highly programmable remote fire sensing cameras on some of the most important wildfire lookout towers in California, located in Marin, Calaveras, Humboldt and Butte counties. Cybersecurity is one of the most important safety challenges for the utility industry, as information technology becomes increasingly integral to our operations and customer service. The U.S. Department of Homeland Security has classified utility assets as a key resource and critical infrastructure for our national and economic security. PG&E is firmly committed to working with other utilities, other essential industries and government officials to develop and implement state-of-the-art cybersecurity strategies and best practices. Our efforts are led by an Enterprise Technology Risk Management team, headed by Pacific Gas and Electric Company’s Vice President and Chief Information Security Officer. This team of security and operations experts continuously identifies, evaluates and mitigates cybersecurity risks across the enterprise. Identifying and evaluating cybersecurity risks revolves around understanding business processes and core enabling technologies, while providing ongoing monitoring of our infrastructure and external threat landscape. Once risks are identified and prioritized, we develop mitigation plans to ensure an acceptable level of risk exposure. Cybersecurity training and awareness continues to be a major focus for all employees and contractors, emphasizing the critical role they play in protecting PG&E assets. All PG&E employees are required to take an annual information security and privacy awareness course, and leaders are subject to additional coursework to further integrate cybersecurity awareness into our culture. PG&E is also increasingly focused on the physical security of our assets and infrastructure. In 2013, gunshots caused extensive damage to PG&E’s Metcalf substation near San Jose. Although no one was hurt and there were no customer outages as a result, we have worked collaboratively with agencies at the federal, state and local levels to enhance the security of critical substations across our service area. Improvements underway at various substations include the installation of new barriers at the perimeter and shielding for certain equipment. We’re also removing nearby vegetation, which may provide concealment, and testing and installing various state-of-the-art security equipment designed to detect and deter a range of potential threats. PG&E is investing heavily to increase substation security for its highest-priority facilities. We have also worked hand-in-hand with other utilities, the Edison Electric Institute and independent security experts. Many of the measures being taken are a result of this coordinated, cooperative effort. PG&E and the utility industry are committed to this kind of essential collaboration by continually sharing information and best practices to stay ahead of threats. To track our progress and promote continuous improvement, PG&E uses a set of formal public safety metrics, in addition to numerous employee safety measures. We have also taken industry-leading steps to link compensation to safety performance. In 2014, safety metrics determined 40 percent of management’s annual at-risk performance-based pay—and in 2015 we increased this share to 50 percent. Safety results continue to be the single largest factor affecting annual at-risk performance-based pay, with financial performance and customer service each representing an additional 25 percent. A number of accomplishments in 2014 demonstrated continued progress on enhancing public safety, including improvements in our average response time to gas and electric emergencies and our performance in repairing gas leaks. PG&E remains unwavering in our commitment to public safety. Our plans in 2015 include continuing to enhance our process to identify and prioritize risks to the safety of our system and improve the condition and performance of our assets, continuing the execution of our Gas Safety Excellence program to maintain our two international certifications for best-in-class asset management, and continuing to strengthen our public outreach efforts and partnerships with local first responders.